Over one and one half million Armenians perished in the Armenian Genocide, the first genocide of the 20th century. Committed by the political party of the Ottoman Empire commonly known as the Young Turks, the killings and abuse occurred during World War I from 1915-1918 before being renewed once again from 1920-1923. The Turkish government had grown increasingly suspicious of the minority Armenian population who they feared had become too powerful and nationalistic, and they therefore planned a deportation and extermination program disguised as a resettlement plan. 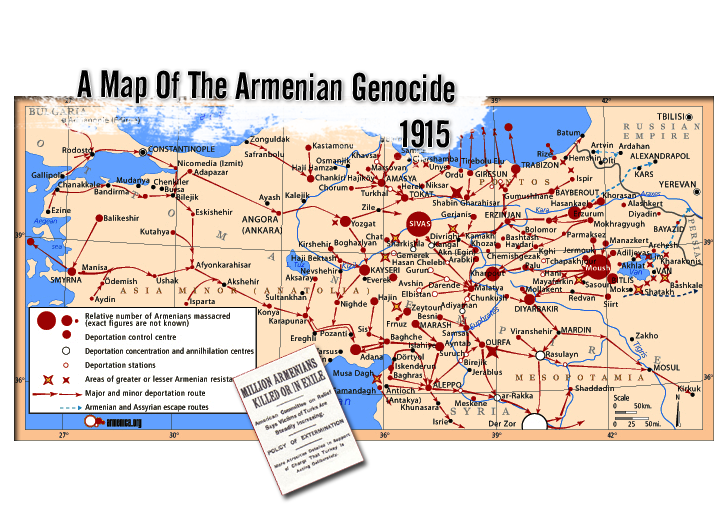 The deported Armenians suffered massacres, starvation, disease, torture, and confiscation of all their possessions. The few that survived became refugees in neighboring countries. Today, the horrors of the Armenian Genocide are commemorated annually on April 24th, the date in 1915 where the terrible intentions of the Turkish government for the Armenians first came to light. This year commemorates the event’s 100th anniversary.